"Grow fruit Not trees By LuStar"
R.V. 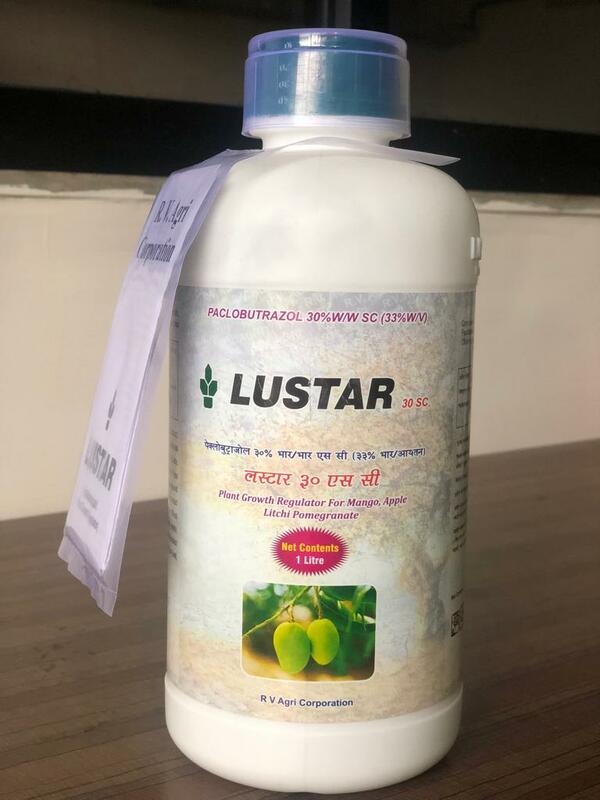 Agri Corporation developed and started manufacturing this amazing product in India is more than 6 years ago, the use of LuStar (Paclobutrazol 25%) has continued to grow rapidly on an ever increasing range of fruit, vegetable and cereal crops. 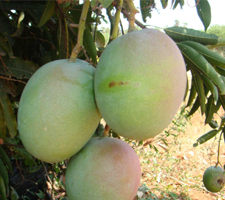 LuStar is most widely used on Mango, Promogate Fruit. However recent work in different global markets has demonstrated the benefits to farmers on crops as diverse as cotton, corn and chilli as well as on tropical fruits like rambutan, date palm, durien and cloves. LuStar plays the same fundamental role in all plants by inhibiting gibberellin synthesis. The primary effect of LuStar is to reduce canopy growth and direct nutrients and the carbohydrates synthesized into the leaves into fruit and seed production, rather than into non-productive leaves and stems. 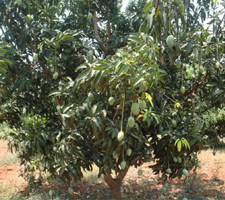 LuStar Plant Growth Regulator assists your mango crops to achieve full blossom potential by making a balance between foliar and fruit growth. Applied after the harvest of fruits will be ideal method of application. Recommended quantity of LuStar to be diluted in clean water of 5-10 liters And applies in a furrow 5 cm deep about 2 to 3 feet away from the trunk fill up with soil after application or apply as soil drench. �Productivity, which consists of yield and quality. �Supply and demand which rule market prices. market, prices fall steeply. 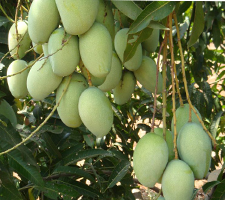 Besides, the onset of the wet season increases the incidence of pests and diseases, which lower fruit quality. The manipulation of fruit maturity in favour of an early harvest would therefore be of great value to growers. Unfortunately, our commercial variety, Kensington Pride, does not flower regularly year after year. Flowering is also staggered, leading to considerable variation in fruit maturity. The induction of regular, profuse, early and uniform flowering will undoubtedly ensure higher yields and better returns to the grower. �A significant increase in flowering leading to increased yields. �The early flowering considerably enhanced fruit maturity. 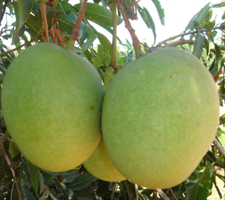 Treated trees flowered three to four weeks early, which reduced the time to fruit maturity by at least two weeks. �Visually, the fruit developed a better external colour. Available evidence strongly suggests that flower initiation depends on the presence of an unknown flower-promoting factor or factors synthesised in the leaves. At the same time, there are other factors in the shoots which work against the flowering factor or factors. It is believed that a group of plant hormones called gibberellins act as inhibitors to flowering. When paclobutrazol is applied to the soil, it moves up through the roots into the shoots and, due to its anti-gibberellin properties, blocks the synthesis of flowering inhibitors, thereby allowing the flower-promoting factor(s) to work. How and when to apply paclobutrazol? The application of paclobutrazol to soil as a drench around the tree trunk (collar drench) is the most effective method, as it ensures proper uptake by the tree. The required quantity is mixed in approximately one litre of water and poured onto the soil around the trunk in a circular band. In the Top End, the ideal time to apply paclobutrazol is from soon after harvest to early January. In dry conditions, a light irrigation is recommended after application. Foliar sprays have been ineffective. At what age should trees be treated and when should treatment be repeated? The size of trees at first application is important. This depends on the age of the trees and the spacing between them. Apart from promoting flowering, paclobutrazol also restricts tree vigour. Trees should therefore be allowed to develop a good canopy before treatment commences. In high tree density situations with closer spacing, it is recommended to apply paclobutrazol early when trees are about three years old. However, when trees are spaced farther apart, say 10 m, early application with paclobutrazol will reduce canopy size and the fruit bearing area. In such a situation, treatment can commence when trees are about five years old. Tree size and canopy fill are important considerations. Large trees, especially seedling trees, respond more slowly than young, bearing, grafted trees. The dosage required also varies between cultivars. Florida cultivars, such as Irwin, Glen and Tommy Atkins require a lower dosage than Kensington Pride. At excessively high dosages, flower and shoot compaction can lead to increased infestation by caterpillars. 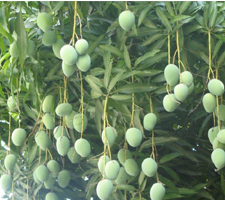 If such compaction occurs, the dosage of repeat applications should be reduced., Two sprays of potassium nitrate at 4 g/L at ten-day intervals, commencing at signs of flower bud burst, were found to minimise panicle compaction. However, compaction is best prevented by using an optimum dosage. If you are not sure about dosage and/or if your trees are ready for the treatment, seek expert advice. It is also important to note that tree size and not age is the key factor for determining dosage. Where there is considerable variation in tree size, dosage may have to be varied. Any treatment that leads to increased production should be supported by good management to maintain tree healthy. This includes nutrition, irrigation, control of pests and diseases, pruning and skirting. It is desirable to prune and skirt trees after harvest and before the treatment. Unhealthy and weak trees should not be treated with paclobutrazol.